We know that as a busy marketer you can not spend hours perfecting a PowerPoint presentation from scratch. Best PowerPoint template was built professionally, to make your presentation slide creation processes fast and simple. It will helps you to spread your ideas in a well formatted and visually appealing slide deck. You are previewing the widescreen format slides of this PowerPoint template. You get both widescreen (HD) and standard size (4:3) templates inside the download package. Watch the video preview of ‘Best PowerPoint template’ below. We have included both animated and non-animated versions in the download package. Best Deck PowerPoint presentation template is truly elegant. It features a modern flat style design theme, which is ideal for any professional business presentation. Best PowerPoint template offers you a lot of layout options and you can easily choose the most appropriate layout for your slides. 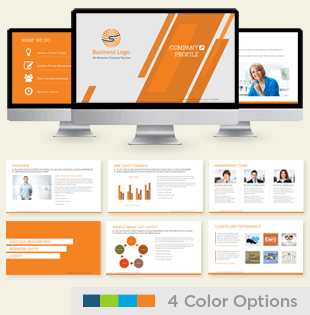 You will love these options and the flexibility it offers whenever you use the template for multiple business presentations. There are separate layouts to present your executive bio and your team information. You may use beautiful master slide templates to showcase your products and/or services. We have included two unique product/service showcase layouts. Of course you can duplicate any of these slide layouts as much as you need! You can customize it 100% to match your brand. You do not want to hire a designer or a Photoshop expert to change something, you can do it your self just using PowerPoint. Simple and fast! You can manage the slide order, style, slide content etc. the way you want (delete, move, add an effect, duplicate). Support videos explain everything step-by-step, using demo slides. 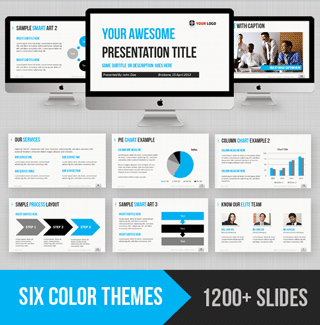 Download Best PowerPoint template here >>.